As part of the OpenStreetMap project, there is a humanitarian aspect, producing maps of the less developed parts of the world. These can be used for both disaster recovery, as was demonstrated after the Haiti earthquake, but also for preparedness in areas of flood or disease risk. Maps are knowledge. They are required to coordinate (often scarce) resources in the event of a disaster or epidemic. And OSM is making these freely available to everyone everywhere, in the same way that Wikipedia is democratising knowledge. As well as being gratifyingly worthwhile, I find this to be a therapeutic task. It requires just enough concentration to keep your mind off other things, but not so much to be tiring in itself. There is something quite nice about starting with a blank slate, and slowly tracing outlines of roads and buildings to form a map. And working with others from all around the world, it is surprising how quickly the map builds up to a high level of detail, detail that probably has never existed on any map before. I also find it amazing how the human brain can take just a few pixels of an image, and work out that it is a house, or a road, path, or tree… although sometimes this is not apparent. 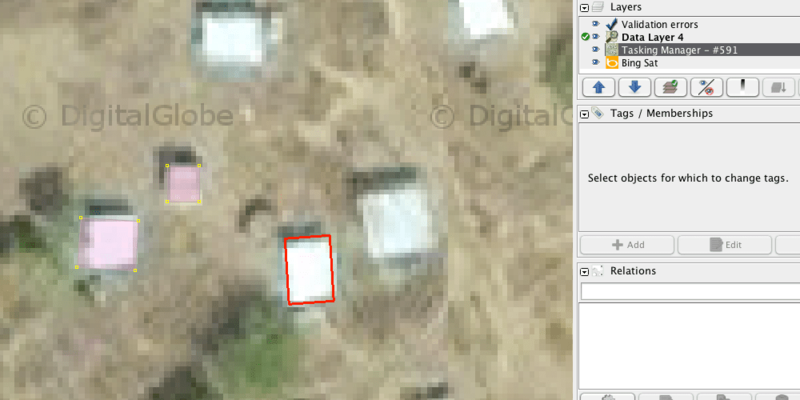 Where there are multiple sources of satellite imagery it is a much easier task. Having another view, in different light, can often make it apparent what you are looking at. There is often only the one source of imagery available, but even changing the zoom level can help to change how the brain interprets those few pixels. I tend to use JOSM for editing OSM, and with the ‘Buildings Tools’ plugin, tracing rectangular buildings is as simple as three clicks to define the corners.It is even easier to trace lots of orthogonal buildings, by selecting one then just clicking opposite diagonal corners of the other buildings. For huts, I tend to draw a single way, make it circular with the o key, copy tags from a previously selected building (shift+r), then copy and paste it as required. The buildings can then be scaled by holding the ctrl+alt keys. If you want to have a go yourself, there are plenty of tutorials on editing OSM at learnosm.org. Then it is a matter of heading over to tasks.hotosm.org and selecting something that looks interesting, relevant, or timely — and getting stuck in on a small chunk. Even if you don’t feel confident enough to mark areas as ‘complete’, going through and adding in some details helps towards the process, and someone more experienced can later review and finish off the area. The OSM map of the world is constantly evolving and improving as individual contributors add in “just one more detail” or “one small tweak”.May often be more than one. Terms and conditions apply. I accept no responsibility for the countless hours you may spend on this.